The technology is getting advanced and progressing at a lightning speed, but still, business owners, and computer users dread is the loss of very valuable data. It is a costly mistake to not to use a pc backup software on their computers. Losing data can mean a disaster and irreparable damage to individuals and various businesses. It is not only necessary to have a software installed, but a reliable one too, that will never fail you. This is very essential to enjoy seamless business activities and avoid any interruptions. Today, organizations from all over the world rely heavily on exchanging data electronically, and ignoring the safety of data can be an expensive mistake. 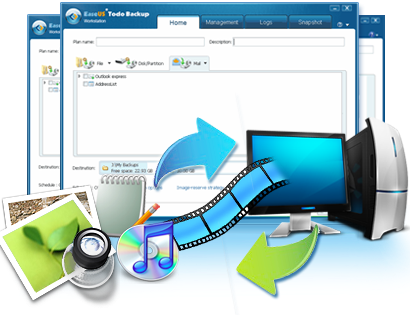 One will come across a number of free backup software available in the market. Look for the one that carries a great reputation, and will serve your needs besides being free. EaseUS is one such trusted name when it comes to data recovery. Now you can make use of the reputed backup tool to back up the complete data, settings and all of your entire system. This is a reliable recovery software for home users and is very easy to use. You can sort out those disaster problems with just one click. One can aloes schedule backup to save time and avoid troubles. It is crucial to create pc backup software in a computer as the systems can crash as a result of the hard disk failure. No organization or business can afford to lose their valuable data and face enormous losses to the business. The kind of backup software one goes for will depend on the kind and volume of data. How important the data is, and any changes made on the data play an important role. There are users and business owners that need data backup services daily, or even hourly. The data back can easily be scheduled and run automatically. The backup sources from local drives are typically sourced from the local drive to destinations such as mapped network locations and USB connected devices. One should look for the exact copies of the original sources, minus any compression or loss of data. EaseUS is a popular free backup software and the friendly wizard boasts of a simple interface that is used by more than 6,000,000 users. It supports Windows 8, 7, Vista, XP. The new version carries smart backup feature and there is no need to download and install software again. The earlier bugs have been removed to improve the quality of the product and its services.